These funny winter hats are a festive twist on a holiday tradition. Brimming with personality, they’re made to last for years of holiday cheer. Made with soft, cozy yarn, each one is carefully handcrafted in Peru by skilled fiber artists who are paid fair wages. Dimensions: Snowman: 20" x 11" x 3"; Christmas Tree: 15" x 11" x 1"; Hanukkah: 20" x 9" x 1"; Santa: 14" x 10" x 1"
Weight: Snowman: 0.46 lb. ; Christmas Tree: 0.59 lb. ; Hanukkah: 0.28 lb. ; Santa: 0.38 lb. I bought two. Beautifully made. Hit of the party. Can't wait until next Christmas to wear again. This was an unexpected very funny gift. everyone loved it. Also, very good quality. Will be used every year. This was a very creative hat. It is nice to wear. Many complements. I was very pleased with the Snowman hat I ordered. It was crafted well . The only think I disliked was the mailing packaging....too much. The funny winter hats from Peruvian Trading Company showcase the craftsmanship of skilled fiber artists who make them to become a cheerful, festive addition to your holiday. The network of knitters and crocheters in and around Lima are paid fair wages, which demonstrates the commitment of co-founders Javier and Patricia Dam to the people of their native country. The couple have been helping support their fellow Peruvians for over twenty years. The knitters work with soft yarn to create each hat that is incredibly detailed and packed with spirit and personality. 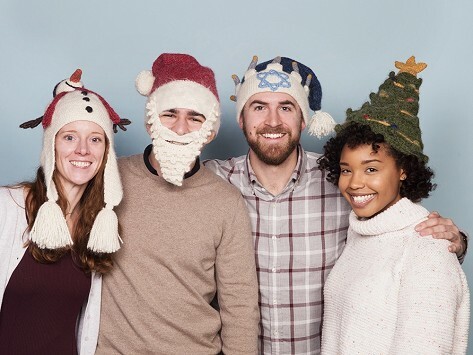 These hats direct the focus to the fun, lighthearted side of Christmas and Hanukkah. One is great to give or keep to start a fun new holiday tradition.